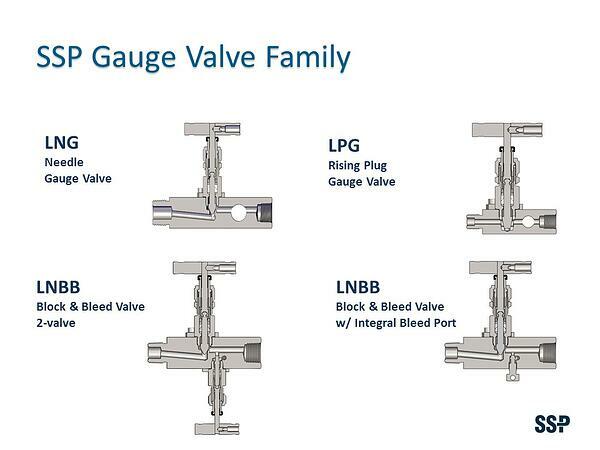 SSP offers needle and rising plug gauge valves in three port and block and bleed designs. Block and bleed valves are available with packed bonnet or non-packed vent valves. All packed bonnets feature live-loaded packing below the stem threads and non-rotating stems for better cycle life, lower maintenance and leak-tight shut off even in severe service conditions. 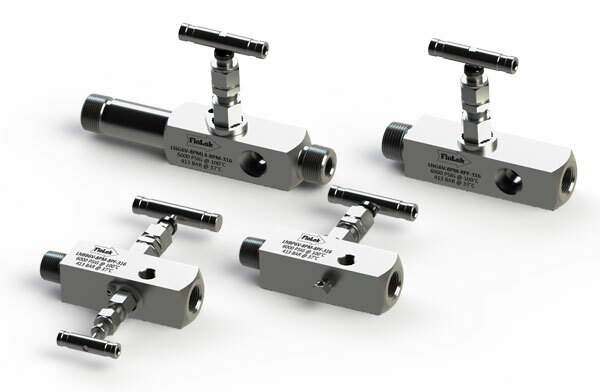 Select Gauge and Block & Bleed Valves for your applications. Download the LN Series Needle Valves Catalog. Inlet: 1/4, 1/2 and 3/4 in. Outlet: 1/4 and 1/2 in. Extended Inlets: 4 and 6 in. In the locked bonnet design, the bonnet is screwed into the valve body to seal on a metal to metal surface. The bonnet is locked in place with a ring, which is secured with a separate screw. This prevents accidental disassembly during packing adjustment, loosening due to vibration, or unscrewing of the bonnet by continuing to rotate the stem after it is fully open. The back-seating lower stem allows inline packing adjustments to be made more safely. Unlike non-rotating ball stem tips, SSP gauge valves are designed with a non-rotating lower stem that prevents seat damage and reduces wear to the seat and packing. The threaded upper stem and stem pivot are located above the packing to prevent system media from attacking the threads, washing away thread lubricants or clogging, or corroding the non-rotating stem mechanism. This ensures that the stem tip will not rotate even in severe conditions. The tighter your system, the better your data. SSP gauge valves are designed with live loaded packing that provides a dynamic leak-tight stem seal, which compensates for changes in pressure, temperature and packing wear. LNG Series are 3-port needle gauge valves with LN Series isolation bonnets and three outlet ports. Non-rotating vee-tip stem provides a durable metal to metal seal. Soft seal PCTFE steel tips are also available. LNBB Series are block and bleed valves featuring LN Series bonnets for both isolation and bleed functions to allow safer maintenance of instruments in systems with hazardous media. LNBP Series are block and bleed valves featuring an LN Series isolation valve and an integral bleed port to allow maintenance of instruments having non-hazardous media. LPG Series are rising plug 3-port gauge valves with LN Series isolation bonnets and three outlet ports. They feature a rising plug and soft seat design with a straight-through flow path that allows rodding. PTFE packing is standard for LN Series valves. Flexible graphite packing is available for high-temperature applications. LN Series Gauge Valves and Rising Plug Gauge Valves are available with 4 in and 6 in. lagging. In addition to end connections offered in the Basic Part Number and Dimensions table, SSP can provide Duolok, Griplok and Unilok tube end connections. Bleed valves and pipe plugs can be ordered installed or shipped loose with gauge valves. SSP Gauge valves are available cleaned in compliance with ASTM G93 Level C and CGA G-4.1, Cleaning Methods and Cleanliness Levels for Material and Equipment Used in Oxygen-Enriched Environments. To specify, add -XP98 to the part number. For more information about other types of special cleaning, please contact your local SSP distributor or SSP Customer Service. above or below ground. SSP offers four configurations to meet the requirements in NACE MR0175/ISO 15156-3 and NACE MR0103. To order gas for you application add the designator below to the part number. 2Compression fittings and valve bodies with compression fitting ports are exempt from lower hardness requirements per ANSI/NACE MR0175/ISO 15156 and NACE MR0103.